Eleven organizations at NKU are on the hunt for your garbage. But just not any old trash. 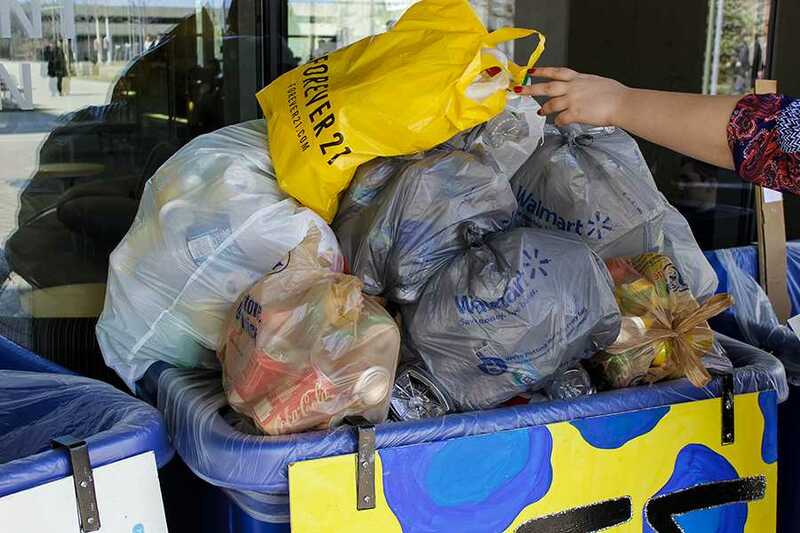 The groups of students are searching for cans, bottles and other recyclable goods in order to collect the largest heap of material possible for this year’s Recyclemania– a nationwide competition aimed to spotlight university recycling efforts and means of waste generation reduction. Photo by Kevin Schultz | A student throws a bag of materials into a Recyclemania recycling bin on campus. In this process, both the student organizations and NKU itself are hoping their efforts don’t go unnoticed. 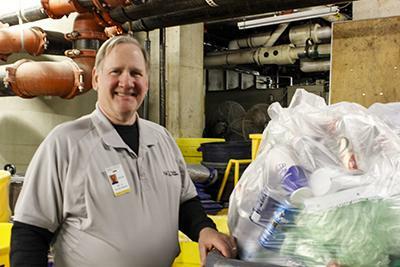 “The main goals of this is to promote student and campus-wide recycling, so that we can all become more mindful of the things we are throwing away,” said Ed Herschede, director of Recyclemania and NKU’s recycling supervisor. The eight-week long competition, which kicked off on Feb. 3, will last until March 30. Out of the 461 colleges and universities that are participating in the 2014 Recyclemania Tournament, NKU is currently ranked in 113th place with a current recycling rate of about 30 percent. The school currently in first place, Antioch University Seattle, has a recycling rate of about 94.4 percent, according to the Recyclemania 2014 Tournament website. 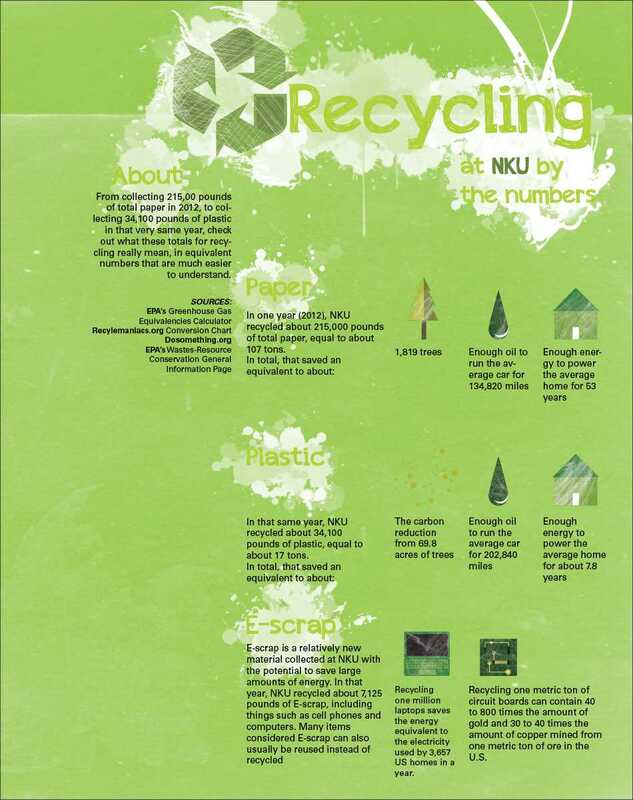 NKU’s recorded recycling rate of 30 percent means that, in the first three weeks of the competition, the university has recycled 22,993 pounds of recycling, compared to 54,581 pounds of materials trashed. This amount of waste NKU has saved in Recyclemania is equal to the energy consumption of four households, eight cars being taken off the road or 42 metric tons of Carbon Dioxide, according to the United States Environmental Protection Agency’s Waste Reduction Model. NKU also currently ranks second out of the three institutions for higher education competing in the state of Kentucky, behind Jefferson Community and Technical College currently at 57.6 percent and in front of Eastern Kentucky University currently at 14.7 percent, according to the Recyclemania 2014 Tournament website. And while Gabbard acknowledges the progress NKU has made and the importance of Recyclemania, she says that alone is not enough. Student organization’s recyclables are collected in bright blue bins that sit outside of the Student Union — right off of the main plaza. Herschede asks for all students to help out the organizations and do their part in recycling. A banquet will take place April 10 to announce NKU’s winning organizations from Recyclemania — the organization that collects the highest weight of recyclable goods wins — and to celebrate the end of the competition. Photo by Kody Kahle | Wooldridge places cardboard inside a baler. 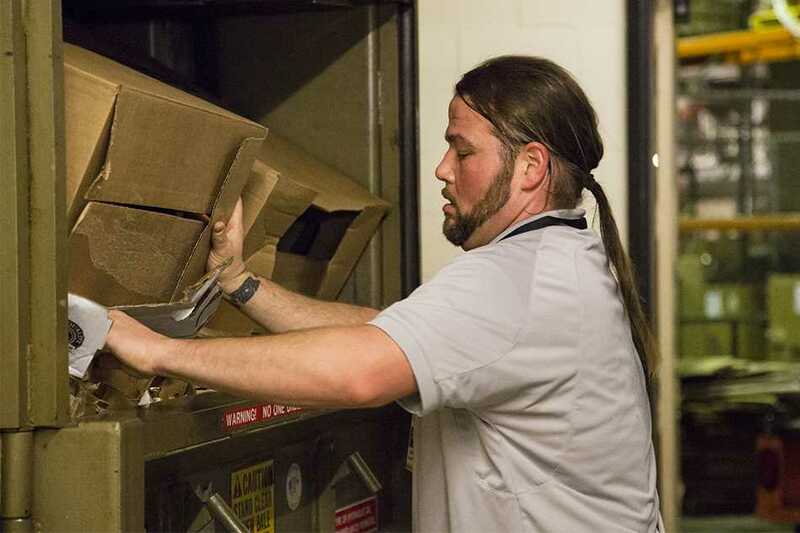 The Recyclemania effort is just one of many ongoing efforts at NKU aimed towards going green and reducing the university’s carbon footprint (the total amount of greenhouse gas emissions caused by an entity). In 2007, former NKU President James Votruba signed The American College & University Presidents’ Climate Commitment, pledging the university’s efforts toward climate neutrality. “Northern Kentucky University documents the size of its current carbon footprint, identifies green initiatives that have impacted our carbon footprint and outlines the university’s current and planned efforts in this regard,” said Votruba in NKU’s 2010 Action Plan, which outlines NKU’s path to achieve climate neutrality by the year 2050. To comply with the climate commitment, NKU is required to calculate its carbon footprint every two years, according to NKU Green Co-Director and University Planner Jane Goode. One figure, Goode noted, from the last time NKU’s carbon footprint was calculated was the 42 percent portion directly caused from the university’s commuters. 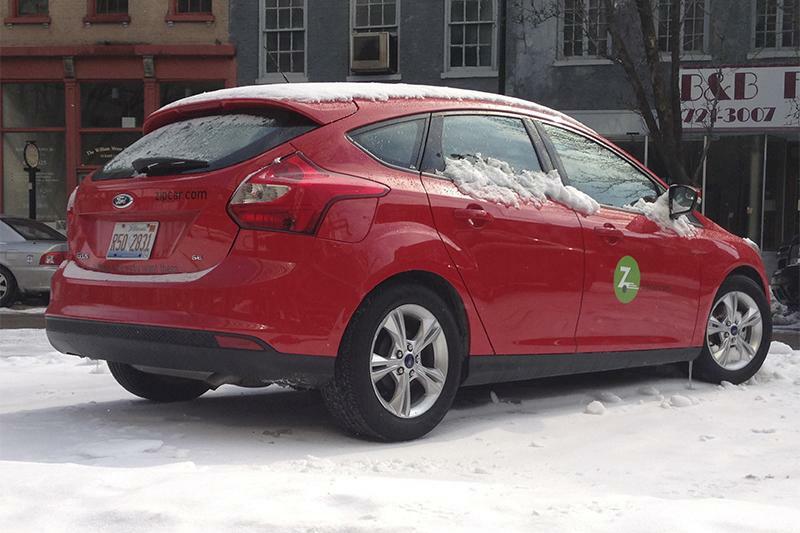 Photo by Kevin Schultz | A Zipcar in Cincinnati, Ohio. One solution, according to Goode, could be the use of Zipcars on campus. Zipcars are vehicles that can be “checked out” by people who sign up for memberships. According to the Zipcar website, the use of these cars cuts down the need for individual use of cars and serves as a backup means of transportation for those who usually carpool or have alternative means of transportation. However, the use of things such as these cars are nowhere in the immediate future for NKU. Other green initiatives at NKU include smaller things such as the use of green cleaning supplies, to larger things such as holding an entire Earth week to help inform the NKU community. About 95-98 percent of cleaning products used at NKU are considered “green products,” according to Goode, stemming from an initiative spearheaded by the construction of Griffin Hall. Earth Week is an annual event at NKU ran by NKU Green which aims to make the university and surrounding area more environmentally friendly. Earth Week at NKU typically includes informational sessions, movie viewings and visits from local environmental groups, contests. In the end, Goode said Recyclemania and the recycling initiative really is the place to start when it comes to going green.